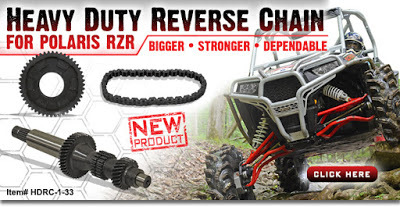 Each GDP heavy duty reverse chain kit comes complete with everything you need for an install and go. Each kit includes 2 chains to give you double the strength. Tests show OEM chains lose integrity at 209 ft-lbs while SuperATV’s chains hold strong at 367 ft-lbs, nearly double the strength! We didn’t stop at strength alone, we know the importance of maintaining a quiet ride. Each chain and sprocket has just the right combination of materials, treating, and coatings to give you the smoothest and quietest ride on the market. With precision gears that are constructed of the highest quality materials, this kit will keep your wheels turning. Super ATV is a privately owned company founded by Harold Hunt in 2003. Everyone here at SuperATV shares your love of the outdoors and off-roading. Because of Harold’s love of off-roading, and a particular fondness for creek riding, he designed our first lift kit – a Polaris Sportsman 2” EZ Install. Boxing and shipping the lifts out of his home garage, he quickly expanded the space and product line to include wheel spacers, bumpers, axles, and long travel kits. Our business has since grown from its humble beginnings in Harold’s garage to our current 232,000 square foot headquarters in Madison, Indiana. Over the years, we’ve built our reputation by offering quality products at the best prices found anywhere. Our shop is where the magic really happens – where our thoughts, designs and concepts come to life. With a lathe, plasma cutter and a full staff of engineers and design professionals, the sky is the limit on what we can do. For more info, go to www.superatv.com.